To me there is something very fascinating about pre-historic art, we can try to imagine those people living a very different life so very long ago, and what they were thinking when they were creating those often very beautiful works of art, but we will never know. Sometimes called the Moose’s Head, was found south west Finland, the figurine is about 10 centimetre long, made of soapstone. Dated to 7000 to 6000 BC. The artwork belongs to what is called “Kunda Culture” of Stone Age hunter gatherers inhabiting the east part of the Baltic region, when the ice cap melted. The head has a hole for mounting on a stick, so might be a sceptre-head used in a ritual context or carried by a shaman or tribe leader. We can expect that there was some ritual or religious intentions, trying to control the harsh and dangerous environment surrounding them, but exactly who they were, why they did it and what was the expected effect, is impossible to know for sure. 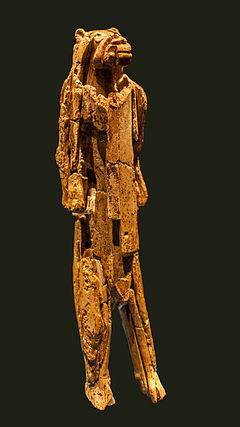 The Löwenmensch figurine carved in mammoth-ivory is 31.1 cm tall, found in a cave in Baden-Württemberg southern Germany. 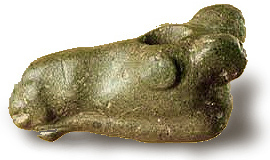 Dated to being about 35,000 to 40,000 years old the sculpture is the oldest known example of figurative art. Studies have shown, that creating a sculpture like this with stone age tools, would have taken something like 370 hours, this is at a point in history where life was short and dangerous. Must have been indescribable valuable to the owner. 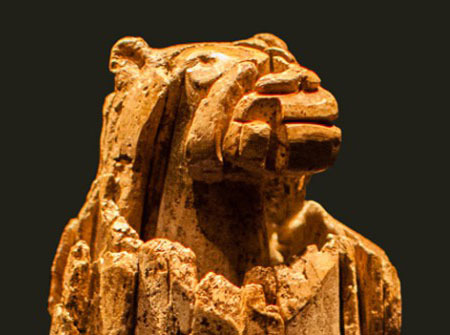 The Lion-Man is infact more likely to be female, with head of a female cave lion. Up until this post I have had a top-page about ”other art’s”, which i would sometimes change. From now on, I will mix those in with “music” posts as regular blog post, removing the page from the top. Could be posts about almost anything as long as I would personally consider it to be art. Sacred Spirit is a German electronic world music project led by Claus Zundel aka “The Fearsome Brave”, releasing a series of albums from 1995 to 2003. Mostly centered around Native American chants on top of chill ambient electronica and tribal inspired rhythms.